Welcome to the PhotoME website! PhotoME is a powerful tool to show and edit the meta data of image files. Thanks to the well organised layout and intuitive handling, it's possible to analyse and modify Exif and IPTC-NAA data as well as analyse ICC profiles - and it's completely FREE! Exif data will be written by the digital camera for each photo with the parameters of the camera. This allows you to see all the used settings, right down to the sensor temperature when the shot was taken. IPTC-NAA data is used by agencies to save keywords, comments and copyright notes. ICC (International Color Consortium) profiles are used for color management. Canon RAW v2 (CR2), Canon Thumbnail (THM), Epson (ERF), FujiFilm (RAF), Hasselblad (3FR), Kodak (KDC, DCR, K25), Konica/Minolta (MRW), Mamiya (MEF), Nikon (NEF), Olympus (ORF), Panasonic and Leica (RAW, RW2, RWL), Pentax (PEF), Samsung (SRW), Sony (ARW, SRF and SR2), Creo Leaf Capture (MOS) and the new open RAW format Digital Negative (DNG). PhotoME also supports Windows HD Photo and Media Photo (HDP, WDP), ICC profile files (ICC, ICM), Adobe DNG Camera Profile (DCP), FotoStation text templates (IPT), Nikon IPTC Data files (NID), the Opanda Exif template format (EXIF), as well as 2 of PhotoME's own formats for the export of Exif and IPTC/NAA-data. 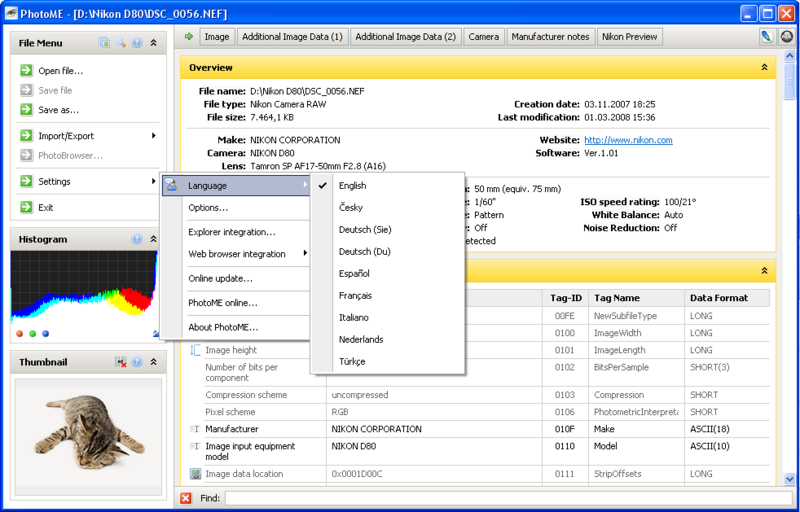 Maker Notes are special Exif tags which are used by the manufacturers to save manufacturer- and camera-specific data. Some manufacturers store data independed of the Exif format, in an own, not public documented format. Some of these formats are also manufacturer spanning (like PRINT Image Matching from Epson). PhotoME will use the auto focus informations saved in the maker notes to visually show the used AF points. If GPS data are available, PhotoME will be able to locate the spot with just one click on Google Earth, in Google Maps, Yahoo Maps, Windows Live Search Maps, OpenStreetMap, Flash Earth, Multimap, MSN Maps & Directions, ACME Mapper, GeaBios, Geody, Wikipedia World, Panoramio, Flickr or the NASA World Wind software. PhotoME can be integrated in the context menu of your web browser. With a right-click on any website image, you can open the image directly in PhotoME. This allow you to open the graphic file with just one click in any graphic applications which is installed on your computer. Many digital cameras saves smaller preview images with every photo, which will be shown in PhotoME. Additionally, PhotoME has basic RAW converter functionality to automatically generate a preview of RAW files which don't include preview images. This RAW converter supports Panasonic (DMC-L1, DMC-LX1, DMC-LX2, DMC-FZ8, DMC-FZ18, DMC-FZ30, DMC-FZ50), Leica (Digilux 2, D-LUX2, D-LUX3, V-LUX 1) and Olympus (E-1, E-300, C5050Z, C5060WZ, C70Z,C7000Z, C8080WZ, SP550UZ) cameras. PhotoME displays a histogram which allow you to disable and enable every single color channel. This gives you a simple option to see whether a picture is overexposed or has a color fault. PhotoME can be integrated in the context menu of the Windows Explorer (32-bit version) - allowing you to open a specific file in PhotoME with just 2 clicks. By dragging a file to the PhotoME window, it will directly show the data of this file. Thanks to the easy to use file tree, you can switch between your images effortlessly. The text output function allow you to export the meta data unformatted, for conversion to HTML or BBCode-formatted text. This option allows you to recover meta data if removed by a graphic editing software. This function is currently only available for JPEG files. PhotoME has an build-in online update function, which allows you to simply upgrade to install new program versions. The most tags (fields) are described with additional content information. All configuration data is saved in XML files, allowing you to simply extend the data base. PhotoME is completely multilingual and because of it's XML base can be easily extended to include more languages. PhotoME runs in many operating systems, Windows 98 SE, Windows ME, Windows 2000, Windows XP, Windows Vista and the new Windows 7. Additionally, PhotoME was tested in Ubuntu Linux 7.04 using Wine 0.9.33 and MacOS X using Parallels Desktop and Microsoft VirtualPC. Best of All: these features are completely free! Sign your photos with your personal QR Code. A project by Jens Duttke.